This article was first published in the Dundee Evening Telegraph, and subsequently in the Inverness Courier of the 1st September 1891. There are a number of comments made, particularly with reference to the Clan Donald at Culloden, which may not concur with the opinions of many of our members. I trust no offence will be taken. The article is offered verbatim. The purpose of sharing this with you is that I believe it offers a unique glimpse into life and customs in Glengarry in the closing years of the life of Alexander (Alasdair), 15th of Glengarry. One of the most interesting personages in Broughty Ferry is Mr William Robertson, the almost nonagenarian poet, with whom a representative of this journal had an interview the other day. He found William in excellent spirits, and hale and hearty in body - "all but a bad leg that sometimes troubles me" - was the poet's remark as he alluded to the cause of just a perceptible limp. He bears his age admirably, and is a keen, alert, intelligent, gentlemanly old man with whom a "twa-handed crack" is always interesting. The poetic fire still stirs his heart, poetic images still crowd his active brain, and poetic grace still turns his verse. He has the sturdy, hardy bearing of the country-bred Scot of a bygone generation. "When were you born?" asks our representative, after William had been comfortably seated, and ready to plunge into reminiscences. "In 1804" was the reply. "In Edward's book on Scottish Poets" he added "it is wrongly given as 1808, but I am now in my 87th year". "And which is your calfground?". "The Carse o' Gowrie - in the parish of Longforgan. My father was gamekeeper at Castle Huntly, and I was born there". "Did you stay long in the Carse?". "No; my father removed when I was a mere child to Invergarry, where he became the servant of Colonel Alexander Macdonell, the Chief of Glengarry then. During my boyhood I resided just beside the mansion-house close by Loch Oich". "were there many more people about Invergarry then than now?". "Well, it's a long time since I left it; but I should say there were many more then than now. And they were a frugal, well-behaved people - although I must say it, a little lazy". "What did the common people live on chiefly in your young days?". "A great dish was brochan, used often for breakfast, and there was often herring for dinner; then they had cakes and bannocks, an' they were awfu' fond o' whisky. They considered it the panacea for a' diseases". "Ay, there was smuggling in those days" and there was a merry twinkle in William's eye as he added, "if it could be called smuggling that they did so openly. Man, I've seen a procession of 40 horses - a man attending on each - all carrying smuggled whisky, and all going quite openly along the road. Each man carried a stout cudgel over his shoulder, and all were as jovial as they could be. Yes Glengarry was an ideal Highland Chief. He was one of the last of that grand old type of men. He kept two bards and a piper, and on all festive occasions the bards chanted the praises of the clan, and narrated the brilliant deeds of the Macdonells. A favourite game in those days was shinty. It was played with great clubs, the men being stripped to the shirt and kilt. Sometimes the contest would be between the lower and upper end of the glen or between two adjacent straths; but whoever were the rivals the game was always fiercely contested. The Highland blood always got on fire, and it was really dangerous for anyone to get in the way of a player. Glengarry himself almost always attended these encounters, as chief of his sept, and it was his custom on such occasions to ride home with the bards chanting before him, and the piper playing by turns. His door was always open to the poorest of his people, to whom he acted as patriarch". "Were the people well off for food in these days?". "Oh! no' so bad. There was no want of fish; plenty of fresh herring and eggs. Eggs were considered very dear at 4d a dozen. Oh, yes, there was oatmeal too; but, mind you, the Highland-man didn't care so very much for oatmeal. If they took it, they preferred it in the form of brochan or brose. They turned up their nose at oatmeal porridge, and I've heard more than one say - what sort of a dish is that to go to the hill with!. Potatoes mashed was a favourite dish, and there was aye plenty of milk. Yes, it was at Invergarry that I met with a hero of the Forty Five. His name was Owen* Macdonell, an active little man, who always went passed at the run, and looked as fleet as a five year old". "What age would Owen be?" "Oh, he was said to be a hundred at that time. The Chief made a great deal of him. Owen was at all the feasts of the Castle, and the Chief always spoke proudly of him as the man who had seen the first blood drawn for Prince Charlie at Prestonpans, and he was afterwards present at Falkirk and Culloden". "Was Macdonell the only Culloden man you knew?". "No, I've known five altogether. There were other two Macdonells - the Black Forester and the Red Forester they were named, from the colour of their hair. The names of the other two I cannot remember. Owen was the oldest, but there were several who lived as long as he did - for James Grant, in his British Battles, mentions one who died as late as 1830, at the age of 108. I was about sixteen at the time I knew Macdonell, and I believe there are few, if any, alive today who can say they ever saw a Culloden hero". "Had you ever any conversation with him about the battle?". "I suppose you know the Macdonalds did not fight that day?." "Yes, it was a difference about precedence of position, and they marched off the field without engaging. Owen, I suppose, was amongst them, for the Macdonalds and the Macdonells are just the same clan". "Quite so. Have you ever been at Culloden field?". "No. I've often wished to see it; but (regretfully) that's a past hoping for noo, I doot. But I've seen Killiecrankie!". "Aye, but Killiecrankie's no Culloden!". "No, no. That was a sorrowfu' day for the Stuarts, and sair, sair suffering it entailed upon many a good Highlander". "No. I have not been able to do any work for some years (he said in answer to another question). I was trained to be a gardener, and am what is known as a landscape gardener. I got my training at Lindertise, near Kirriemuir, as the servant of Mr Gilbert Laing Masson, I have been engaged at Tullymet, Ballechin, and lots of other places in Perthshire since then. Man, I must tell you Invergarry was a bonnie place in my young days. You could have seen the yellow daffodil and columbine growing in acres - the columbine, you know, darts off in every variety of colour." *Owen is probably a misunderstanding of the Gaelic pronunciation of Ewen/Ewan/Evan. 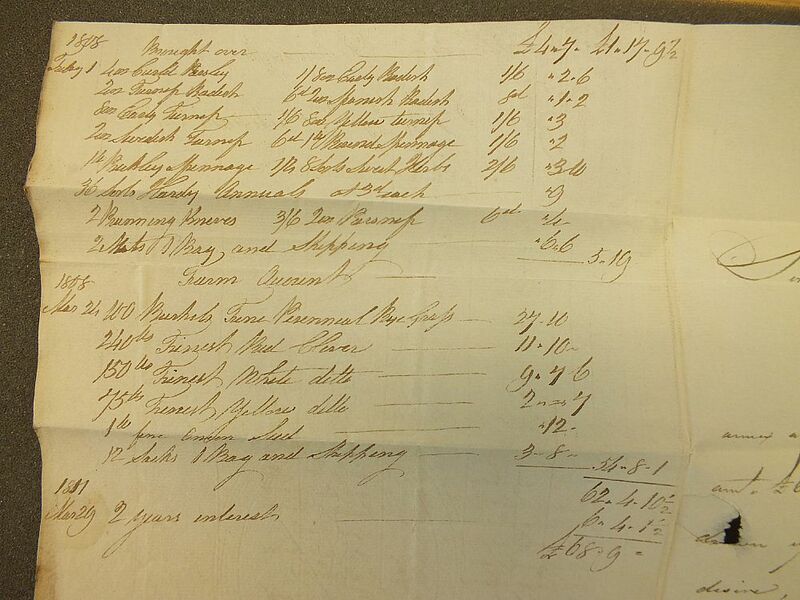 There are two Evan MacDonells listed in Glengarry's Regiment in No Quarter Given, both of whom survived, but then surrendered on the 15th May 1746. Unfortunately William does not tell us exactly when his father "removed" to Invergarry, simply saying he was a mere child at the time. Given that he was born in 1804, he probably arrived sometime prior to 1810. Glengarry died in 1828. It is interesting that he refers to Invergarry as a bonnie place, and makes particular reference to the flowers. Clearly his future career was already in evidence. 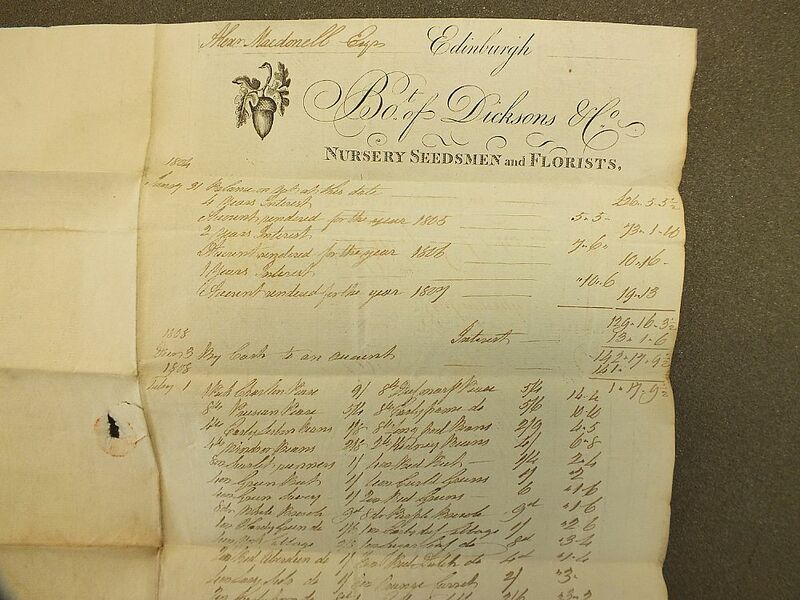 Glengarry married Rebecca Forbes in 1802, and over the next few years, probably under her influence, there was significant expenditure in plants and flowers. 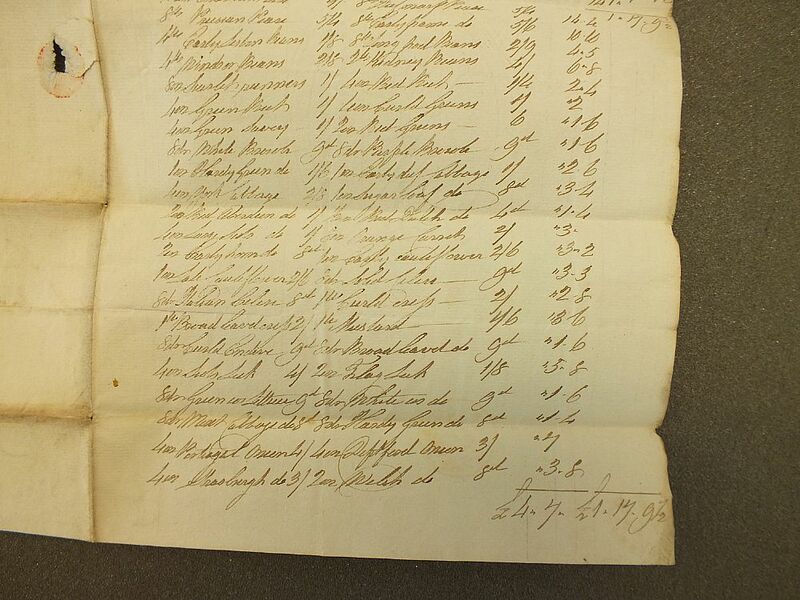 A statement dated 1811, but referring to the years 1804 to 1808, is shown below. Over these four years costs of £182.00 were incurred (of which £68.9.0 is shown as outstanding). Doubtless much of what William remembered as a child was the result of these purchases.